SHAKUR STEVENSON: "I WANT TO TAKE OVER THE SPORT OF BOXING...I'VE GOT A LOT OF GOALS"
At some point everyone has dealt with it. In particular, every young person must endure the pressure of expectations from the wider world. When the young person is also a gifted and dedicated athlete who has medaled in the Olympics, the intensity of those expectations can become even stronger. 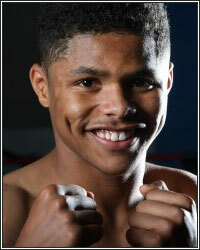 Twenty-year-old Shakur Stevenson (3-0, 1 KO) has ensured that his team is made up of people who not only support him, but help him improve as both a fighter and a person. An old adage in boxing states that a trainer is only as good as their fighter, and a fighter is only as good as their trainer. When the boxer in question has also grown up with his coach, and his trainer is also his grandfather, the relationship is that much more meaningful. It was thanks to Stevenson’s grandfather and co-trainer Wali Moses that Shakur began boxing at the age of five. At nineteen, he won silver in the 2016 Olympic Games, and now he’s a hungry and promising professional fighter. Newark, New Jersey, where Stevenson grew up, is well-known for its crime. In 2016, the city had the sixth highest homicide rate in the country despite its relatively small population. With all of the trouble and the lure of instant gratification lurking in young Shakur’s surroundings, it was Moses’ influence that kept Stevenson in the gym and focused on his craft—and off the streets. But for now, Shakur’s career is burgeoning and he has a lot to look forward to. The hungry fighter has a lot of goals in mind, both short- and long-term. “Short-term, I want to start catching more knockouts. But I don’t want to go out there taking [shots] for knockouts. I want to just keep boxing how I box, and a lot of knockouts can come to me. “Long-term, I want to take over the sport of boxing. I want to do it how Floyd, Terence Crawford, Andre Ward, all of them did it--I want to take over boxing in that way. I want to make my way to the top. I want to take all the belts in my weight class and all that stuff. “I’ve got a lot of goals I want to complete,” he said with a laugh.